Today I’m going to install the VMware ESXi Embedded Host Client software on one of my Supermicro SYS-5028D-TN4T lab servers. This is a VMware fling I’ve kept an eye on since it’s first release and much as I would like to see it on our production systems it isn’t’ something we have signed off on change control wise. Of course my home lab servers are another matter so let’s get to it. If you haven’t looked at the VMware labs fling pages before I strongly recommend you check them out. The EHC has actually become an officially supported VMware product so my hope is the production systems under my control will soon have it installed, assuming the change control passes. There are two ways we can deploy the EHC to ESXi hosts – either via VMware vCenter Update Manager (VUM) or by copying the file to a location accessible by the host and running the esxcli command to install the vSphere Installation Bundle (VIB). You could copy the VIB to a local or remote datastore or even pull it down from a location such as a website over HTTPS for example. In a larger environment it would make sense to use VUM as this will enable centralised management and deployment of the software. 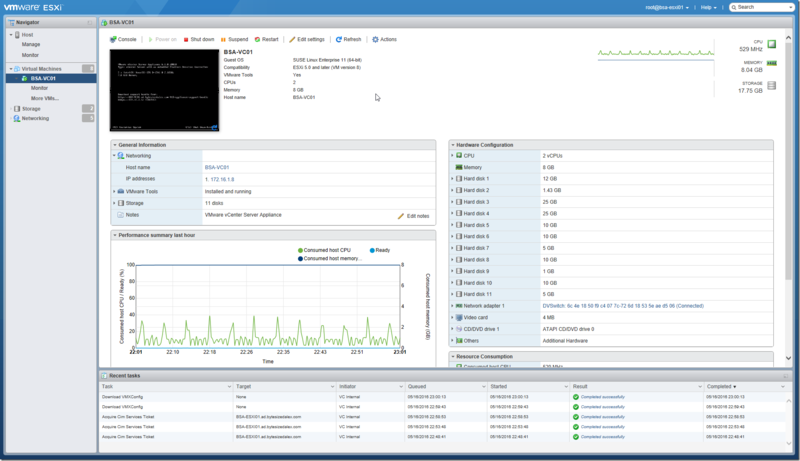 If you are deploying the latest version of ESXi and VUM you will likely find EHC is already included and deployed – VMware are integrating it and supporting EHC moving forward. Let’s first check whether there is a version installed, to do this we can SSH to the host and use the esxcli command. In this case I’m rubbing the command, telling it to get me a list of the VIBs installed while looking for one with the name of esx-ui. No VIB matching VIB search specification 'esx-ui'. In this instance there isn’t an existing version of the software installed so we can move forward to installing. For a lab environment like mine the easiest way to deploy the VIB is to copy it to a datastore or local directory on the host and then run the esxcli command necessary to install. In this instance I copied the latest version to the /tmp/ directory on my lab server and then ran the command to install. As you can see the software installed and it does not require a reboot which is welcome. 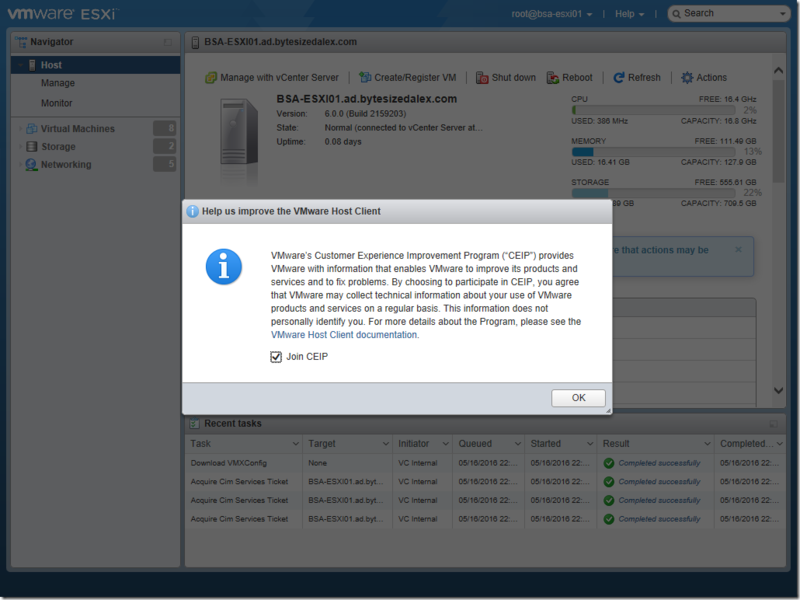 If you have not replaced the certificates on your ESXi hosts you may receive a certificate error – newer installations will likely have vCenter issued certificates, make sure the vCenter certificate authority is trusted by machines. This example shows a connection with no certificate errors in the URL bar – in this case I had replaced the certificate on the host via vCenter. Once logged on the system will present us with a request to join the Customer Experience Improvement Programme (CEIP). Here is an example of a virtual machine view, the detail is great and the interface is responsive. I really like the EHC and it is a glimpse of the future – a future where we no longer rely on Adobe Flash for the vCenter web interface and instead enjoy a plugin free, fast and responsive management platform.